Craigroyston BC lifted the AC Taxi Cup at Ainslie Park with a 2-1 win over Blackhall Athletic FC. Goals from Tyler McKinlay and Max MacGillvray were enough to secure the win with Owen McMillan claiming a added on time consolation for Blackhall. Craigroyston BC reached the final with a 2-0 defeat of Fernieside in the semi, whilst Blackhall were victorious over Edina Hibs Green 6-3 to claim their spot. Both teams started nervously as can only be expected given this was the first time either team had experienced being in a cup final and the pitch must have looked vast at Spartans Academy. The first chance came for Craigroyston when they were awarded a corner on the left. Christopher Bell played the ball into the back post area where Steven Pouton met the ball but his header went wide of the post. Craigroyston then had a good chance on the 10 minute mark when Tyler McKinlay's initial shot was blocked and Max MacGillvray put the follow up wide of the left hand upright. Blackhall had to defend a couple of corners which Craigroyston forced down the right but they could not capitalise with Pouton heading wide with his effort from the latter. One of the best moves of the half came from Blackhall when McMillan found Craig Affleck who slid in Thomas Mackay. 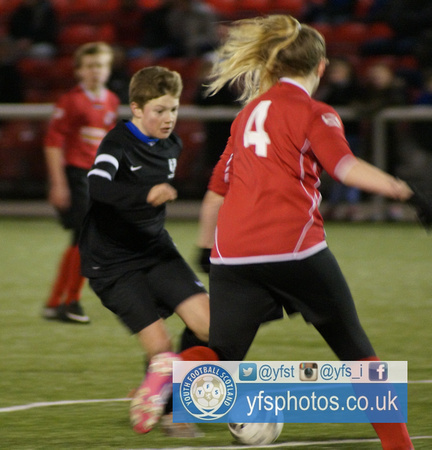 But Craigroyston's McKinlay denied him the opportunity to get his shot away with a well timed tackle in the box. It looked like the deadlock would be broken on the 28th minute when Ben Hunter hit a lovely shot which looked like it was going over Adams in the Blackhall goal but the keeper grasped the ball out of the air to keep the score at 0-0. With half hour gone neither keeper had really been forced into a save of any note in this cup final and the game was desperately crying out for a goal. The half time whistle blew to bring a pretty nervous and uneventful first half to an end. Blackhall got the game under way after the interval but Craigroyston started the brighter side with McKinlay showing good intent getting down the right side. Craigroyston were awarded a free kick 28 yards out when Thomas Hedges fouled MacGillvray minutes later. McKinlay took responsibility and did not let anyone down on 45 minutes when his free kick came off the inside of the post and in to give the his team the lead. Three minutes after opening the scoring, Craigroyston doubled their advantage. MacGillvray picked up the ball and from 20 yards out and fired over the top of Adams and into the net to spark a lap of honour round the park by most of the Cragie team. The game had suddenly burst into life and the Craigroyston drum filled the air a Blackhall had to now go for it. They had a half chance on 57 minutes when Nathan Pearse played in a corner from the left which Chelsea Diamond tried to clear but the ball spun up into the air. Darren Owen in the Craigroyston goal, who didn't have much to do, was alert to claim the ball before Thomas Palmer could head home. McMillan seemed to take the responsibility to get his team back into the game and was unlucky on several occasions. Firstly his goal bound shot was cleared by McKinlay and then he made a good run, but found himself crowded out on the edge of the box before he could get a strike away. Blackhall came close to reducing Craigroyston's two goal lead through McMillan again, but Owen got the slightest of touches on the ball to turn the shot behind for a corner. Unfortunately Blackhall could not create anything from the set-piece. Blackhall had been the better team in the last five minutes but the game had now entered into injury time. Blackhall continued to push forward and got their reward. The hard working McMillan, who thoroughly deserved his goal, blasted home after being found by Palmer with the pass. With time running out and well into the two minutes of injury time, Blackhall could have taken this tie into extra time. Pearse played a beautiful ball into the path of McMillan and he drove in from the left side of the box. With Owen the only thing between him and the goal he agonizingly shot wide of the far post from eight yards out. This was the last action of the game and sadly showed the fine line between winning and losing. Both teams gave their all on the night and deserve all the plaudits they get but there has to be a winner and that accolade goes to the AC Taxi Cup Winners 2015, Craigroyston BC. Owen McMillan - Played well all night and looked the most likely to score for Blackhall. That proved the case in the 71st minute when he gave his team a goal and a lifeline in the match. Daniel Crooks - Defended well all night and done the easy things at the back to halt Blackhall. Owen McMillan's goal in added on time to give the game a interesting last few minutes. Max MacGillnray's 20 yard strike over the keeper that turned out to be the winner for his side.